Utah's Tea Party-killer app: Watch out, Mike Lee. 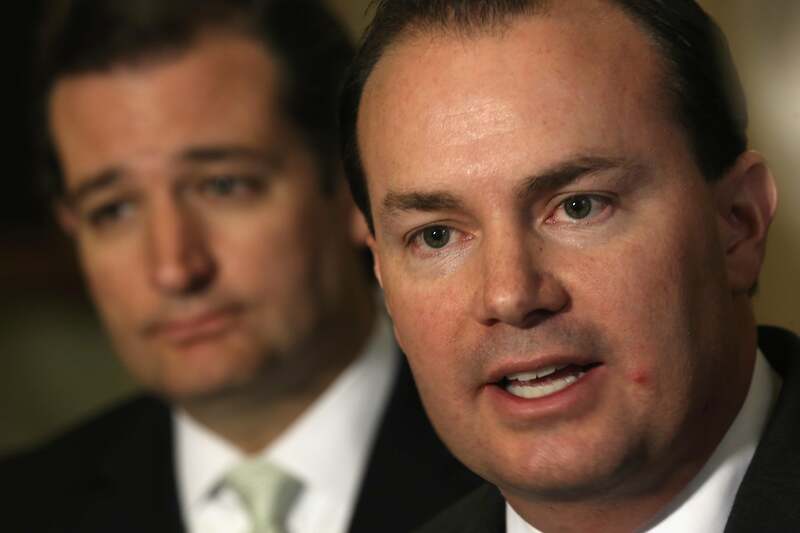 Mike Lee should watch his back—and not just because Ted Cruz is back there. Phil Rucker has a typically fascinating story from Real America, with the first evidence I’ve seen of “the establishment” actually turning on a Tea Party member of Congress because of the shutdown, and coming up with a way to unseat him. Up to now, polling that’s shown Sen. Mike Lee slipping below the 50 percent mark hasn’t really mattered, because Lee doesn’t have to face any re-election until 2016. * And when he does, he’s expected to enter a convention—a party meeting heavily slanted toward activists. It was a convention that saddled the Virginia GOP with its unelectable lieutenant governor nominee, E.W. Jackson. It was a convention that forced Orrin Hatch into a primary (which he won). It was a convention that undid Bob Bennett in 2010, allowing Lee to win a primary against another Tea Partier. But what if there’s no convention? Establishment figures in Utah have long loathed the convention system and are launching a well-funded effort to change it. A bipartisan group including former governor Michael O. Leavitt (R), a George W. Bush Cabinet official and close Romney adviser, has launched Count My Vote, a ballot initiative to overhaul Utah’s nominating process. The group has raised more than $500,000, most from major GOP donors. Well, that would change things—and it would advance a trend. The major electoral reform to come out of the 2012 GOP primary was “binding” delegates, requiring the delegate counts from caucuses and conventions to match the vote shares of primaries. This was done after the establishment was irritated by Ron Paul’s post-facto convention wins, which nearly gave him enough delegates for a floor challenge in Tampa. *Lee actually underperformed in 2010, winning 62 percent of the vote in Utah in a fantastic Republican year. Compare that with the 73 percent Mitt Romney won in 2012.